The panel picks the matches they’re most looking forward to. 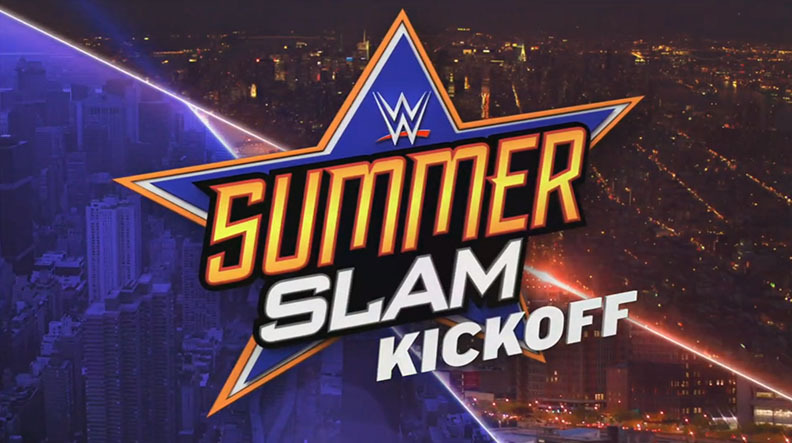 They also announce the three kickoff matches and discuss the best of seven series between Cesaro and Sheamus. Buildup for the Cena/Styles match. The panel discuss Cena and AJ. Lita and Lawler pick Cena, Booker T picks Styles. Booker T explains that calling Apollo Crews “Creed” is disrespectful, but Lawler still doesn’t understand why. Booker T and Lita pick Crews, Lawler picks Miz. Tom Phillips welcomes Chris Jericho and Kevin Owens. As polite Canadian boys, they apologize to Phillips for calling him the wrong name. Jericho also announces that he has become an official, certified G. So you can teach that, but you can’t teach chemistry. Booker T talks about Canadian wrestlers while Lita talks about egos. Good match. As with many 12-person matches, there was stuff happening all over the place. There were two big breakdowns: one right before the break where everyone fought everyone, and one towards the end of the match that turned into an extended parade of one-on-one (and sometimes two) spotlights in the middle of the ring. There was a big dive to the floor, which also seems to be required of matches like this. I liked the finish because it could set up a feud, but it loses a little bit of believability because one of the guys had to unnaturally work his way into position for it to happen. Dean Ambrose has fought to be where he is, but Ziggler is just too good. The panel discusses Ziggler’s closing window of opportunity. The entire panel picks Dean Ambrose to win. Baron Corbin walks up and interrupts the panel. He says that he was supposed to have a match with Kalisto, but Kalisto backed out because he’s hurt. Renee tries to ask him a question, but Corbin refuses to answer and walks away. The panel discusses Rusev versus Reigns. Lita picks Reigns, Lawler and Booker T pick Rusev. Buildup for Sasha Banks versus Charlotte. Sasha Banks answers some questions from the WWE Universe. She says that Charlotte smells. Booker T and Lawler pick Charlotte, Lita picks Sasha Banks. Good match. Zayn and Neville started strong with some good teamwork, then the Dudleys took over with their strength. The momentum would shift again due to continued miscommunication with the Dudley Boyz. This was a pretty solid match, though there was nothing too surprising or out of the ordinary about it. Finn Balor is a rising star, but Seth Rollins did it all first. Booker T is really looking forward to the match between Rollins and Balor. He thinks Balor will bring something new out of Rollins. Lawler thinks Rollins won’t be scared of makeup. Lita says it isn’t just makeup. Lita picks Balor, Lawler and Booker pick Rollins. Very good match. These two started fast and strong in the first match of the best of seven. They pulled out some big and unique moves, making me wonder what else they have in store for their next few matches. This was an exciting match and was a great warm-up for the PPV (though it could have been on the actual show). The panel discusses Orton versus Lesnar, and Booker thinks someone is goingto bleed tonight. Lawler and Booker pick Orton, Lita picks Lesnar. Lesnar versus Orton, fifteen years in the making. This was a good warm-up for Summer Slam. The three matches were good and as much that could be expected for a show like this, but I would like to have seen more backstage interviews. It makes me wonder if this matchup will steal every show it’s on.